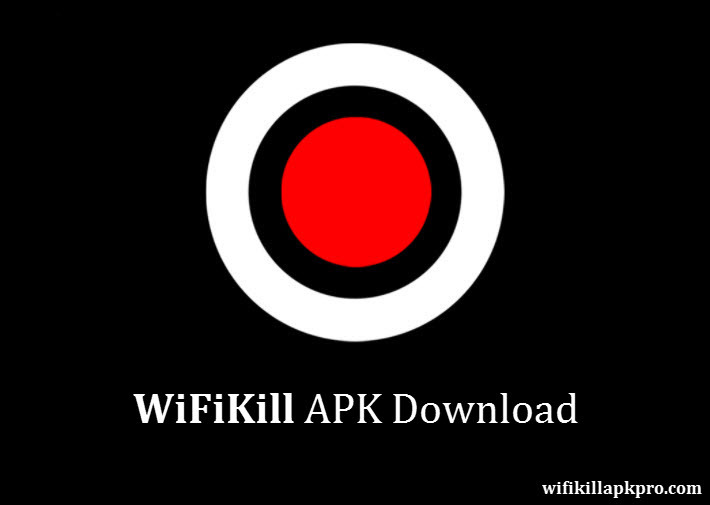 WiFiKill Apk Download is useful to speed up your Internet connectivity by disabling others from the WiFi network. This is helpful when you need the Internet at a lightning pace. Perform WiFiKill App Download on your Android to disable Internet for other users (friends or neighbours). Downloading WiFi Kill App is NOT at all hard as you might be thinking. 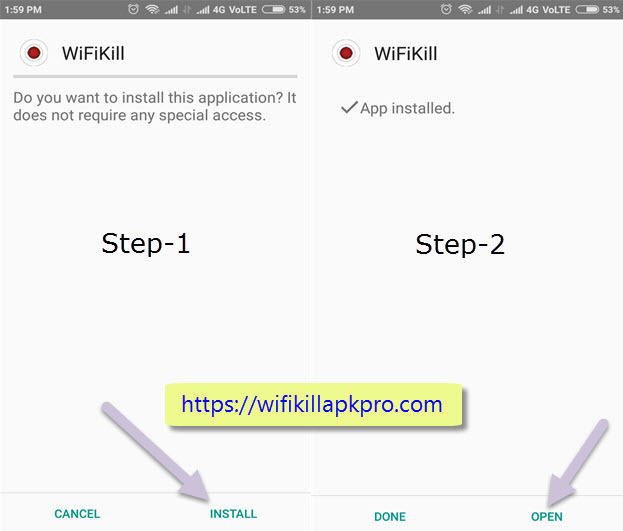 Here I’ll show you the step-by-step guide (with images) to free download WiFiKill Apk for Android or PC in 2019. The lite or WiFiKill Pro version is also available. Everyone who connects to a WiFi network (be it open or secured), must have faced the problem of the slow Internet when there so many users connected to it. This will consume time for downloading or browsing purpose. What happens if everyone uses this app? Yes, this is a fair question actually. Here is the answer to this query. Everyone needs super-fast Internet only at some point of time in a day. So, after utilizing the Internet for that period, you can stop disabling others from that WiFi network. This way, everyone can get benefitted from the app. We all watch movies using our mobiles. If you don’t have time to see them, then you probably download the movie. You can download movies in HD very quickly using this app apk. Nowadays pictures have become part of our life. One app to enjoy your favorite movies is movie hd apk for android. This movie apk is available for all android mobiles. Download the apk and install it. The movie app has a good interface and updated content. Spend your free time with the films. So, this wifi disabling app is useful to relish movie hd on your mobile. If you’re a movie fanatic, then this wifikill app is for you. Okay, let’s dive into the main process. You can disable your neighbours or friends devices who are using the WiFi network that is created by you without your permission. If you don’t recognize that, you’ll face the slow Internet problem. 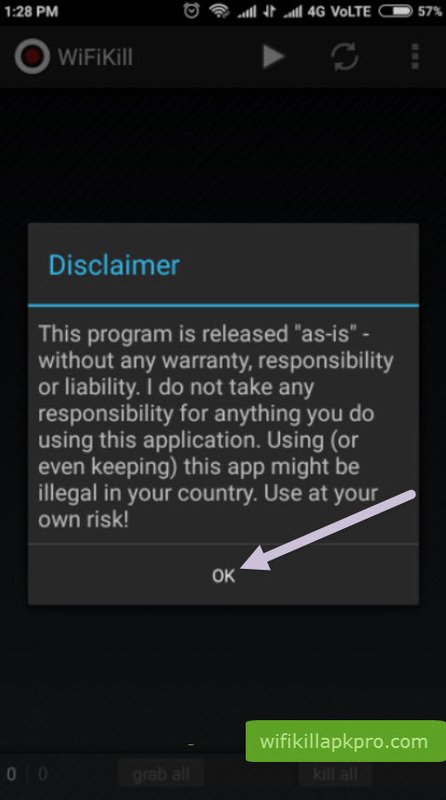 To install the WiFiKill Android app, your Smartphone must be a rooted one. Rooting gives you full and deep access to your mobile functionalities. There are various methods available to do it. Here is how to do it according to your mobile brand and model. To know more on rooting, read this article. Note: If you want to get WiFiKill for Android without rooting, then check out this post. After doing that, you need to follow the below strides. On your mobile, step into the mobile Settings. Go to either Security or Privacy Settings (according to your phone). You’ll see Unknown Sources option with a button next to it. Tap on that button to enable it. 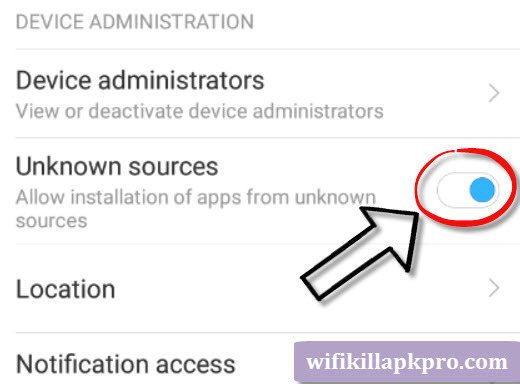 Now, get the WiFiKill root Apk for your Android. There are two variants available here; I suggest you go with the latest one. It’ll save to a location according to your settings. Go to that directory and install that WiFiKill apk file. Installation takes only a few seconds, meanwhile please be patient. Once installing is finished, run and explore the app. That’s everything I wanted to tell you regarding the download and install processes. 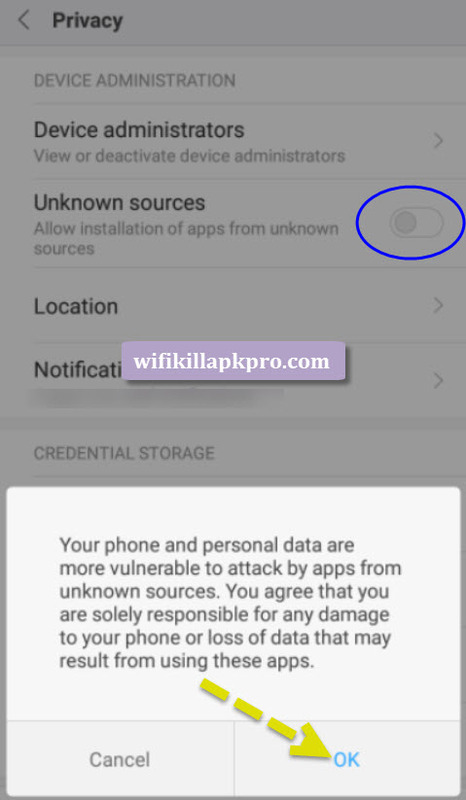 I don’t want to stop the post without giving you the basic information on features of the app and how to use WiFiKill Apk. Here are some cool attributes of the WiFiKill app. Firstly, WiFi Kill is a free app. No need to purchase anything in the app. Sign up, or login credentials are not required, you can use it directly. WiFi Kill will scan for the gadgets that are connected to the WiFi. Grab and Kill options to make it easy for disconnecting them. You can either disable a particular device or all the devices. The app is available for PC, iPhone and iPad as well. So, you can download the WiFiKill for PC or iOS gadgets. WiFiKill 2.3.2 official apk supports the Android versions that are 4.1 and up. Run the WiFiKill free app on your Android mobile. You’ll observe something like the Play button, click on it. It’ll ask for root permission, tap on Grant. Then the app will show you all the devices that are on the same WiFi network. After that, you select a specific device or click on “Grab All” to choose all of them. 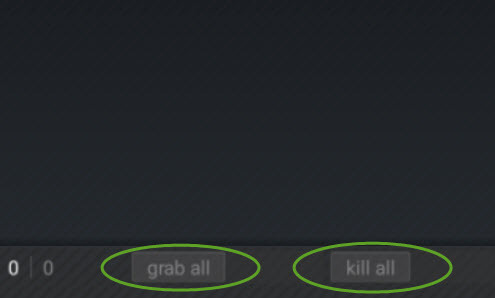 Now it’s time for the last and easy step, launch the “Kill All” button. That’s all; you can now explore anything at Internet speed. If you’re a kind-hearted person, you can stop the app after the completion of your need of speed Internet. Want some bonus offers? Check these out. There is a lite or beta version of the program available, called as WiFiKill Pro Apk. This 2.3.2 version also gives you the exact experience just like the full variant. To download the WiFiKill app on iPhone or iPad, please follow the given tutorial. You’ll enjoy the app on your iOS just like on any Android phone. On Windows PC or Mac laptop, you need an emulator. To know more about this, here is a detailed guide to download WiFiKill free on PC or laptop. If you encounter any trouble with the app or it is not working, then try to clear cache and check once again. I’ll very soon post an article on that topic as well. With this, we have come to the conclusion. Hope you did the download WiFiKill apk free version successfully on Android to cut WiFi connection for others. The Android WiFi Kill App works on Lollipop, Marshmallow, Nougat or any other version. If my post is helpful, share with other folks and don’t forget to post your thoughts on my article in the comments. Disclaimer: We are neither promoting nor encouraging you to use WiFiKill on your mobile. Using this app in public WiFi network may be illegal according to your country laws. This tutorial is only for educational purpose. You’re awesome! Now I’ve the WiFiKill to play around. Good to hear that, Lary.